Municipal grade, professional parking signs that do not rust and can easily withstand harsh weather conditions for many years. We do accept government purchase orders. No order is too big or small. All signs are made with the highest quality .080 aluminum, coated with the industries best 3M or Avery reflective sheeting and printed to last beyond the sheeting warranty. We proudly serve the sign needs of states, counties, cities, towns, villages, road districts, businesses, shopping centers, construction companies, hospitals, schools, mobile home parks, golf courses, airports, homeowner associations. If you don't see what you are looking for please give us a call (877-936-9998) we will help. At Traffic sign Corp. our goal is to offer you the best prices, quality products & fast service on your parking signs, no parking signs, custom parking signs, handicapped signs, posts, hardware and so much more. All standard signs meet State and Federal MUTCD guidelines. Please give us the opportunity to help you with your church, school, shopping center or business parking signs. Put our many years of experience in the sign business to work for you. 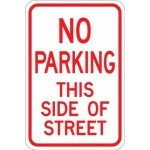 trafficsigns.com offers quality parking signs, no parking signs, traffic signs, handicapped signs, road signs, school zone signs, U channel posts, parking sign hardware and more. 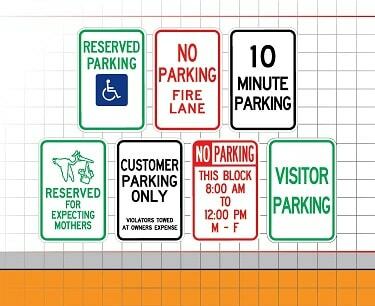 We will help you choose the right material for your custom parking signs. Temporary or permanent, reflective or non reflective we can help you save money and get the quality parking signs you are looking for. Call, Email of Fax your sign ideas. We will design your parking signs and send you a proof. Add a log, artwork or request a special color at no extra charge.